Millions of people suffer from anxiety-it can keep you trapped in the "worry cycle." When you're under stress, your thoughts are racing, and you find yourself repeating the same anxious patterns over and over again, it has a negative impact on your relationships, health, and overall well-being. So, how do you get past your anxiety to increase peace and relaxation in your life? Yoga-cognitive behavioral therapy (Y-CBT) can help. This book offers the first research-based model to combine the benefits of traditional psychological practice with the therapeutic benefits of Kundalini yoga. This combination will enable you to effectively address both problematic thought patterns and the physiologic outcomes of emotional distress simultaneously. 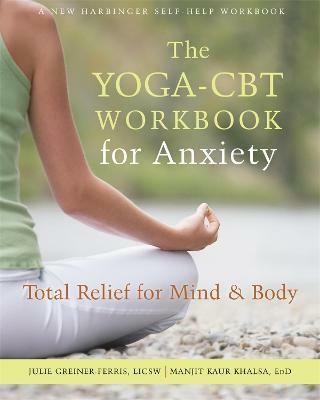 With the proven-effective techniques provided in The Yoga-CBT Workbook for Anxiety, you'll find peace for your anxious mind and a state of relaxation for your body. More than just being able to manage your anxiety and stress, you'll be ready to transform your whole life for the better. "This workbook represents an important contribution to the self-help literature on managing anxiety. The authors, both seasoned clinicians, started with a clinical intervention that they developed and utilized with many clients, then conducted research that demonstrated its effectiveness. From that foundation, they have crafted a self-guided tool and imbued it with clarity and compassion. That tool can help people manage the problematic anxiety that all too often interferes with living. Much is written about integrating mind and body; this self-help workbook succeeds. Both yoga and CBT are made accessible, and a six-week path of physical and cognitive steps is simply and effectively laid out to help. I highly recommend it!" --Jon Jaffe, LICSW, vice president of Consultation and Behavioral Health Divisions at the May Institute "I found the neurobiology involved in a person's anxiety, and in how to take control over that anxiety, to be described very clearly and thoroughly in The Yoga-CBT Workbook for Anxiety, especially for a nonscientific layperson-. Who knew that carbon dioxide plays such an important role in our thoughts, emotions, and behavior? Therapeutic principles of treating many psychiatric conditions were well incorporated into this guide. Particularly valuable is that this workbook goes beyond illustrating how to decrease symptoms; it takes the reader to the next level: how anxiety impacts a person's communication and relationships. Understanding the biochemical processes that are involved in one's feelings of self-worth and one's ability to communicate is only one part of the 'equation.' Integrating that knowledge with meditation and yoga techniques can produce changed behavior. Incorporating the guiding principles set forth in this workbook can lead to a richer, better, and calmer quality of life." --Dallas R. Gulley, LICSW, assistant vice president of Behavioral Health Services Division at Riverside Community Care "A recent, broad movement in psychotherapy has been the incorporation of the contemplative components of yoga, mindfulness, and meditation, alongside CBT, which is well known as the current dominant therapy for mental health conditions. This book, by therapists who have significant experience with the implementation of yoga as a therapeutic intervention, takes us further into the next wave of psychotherapy by also incorporating the breath regulation and physical practices of yoga. This has taken full advantage of effective practices that work on the mind-body connection to enhance therapeutic benefit, and is presented in a simple and practical text that is suitable for patients and therapists working with anxiety." --Sat Bir Singh Khalsa, PhD, assistant professor of medicine at Harvard Medical School, research director for the Kundalini Research Institute and the Kripalu Center for Yoga & Health, and editor of the International Journal of Yoga Therapy and The Principles and Practice of Yoga in Health Care "This wonderful book grew out of clinical work the authors have done for years with real people struggling every day with anxiety and depression. They knew that a quieter mind would lead to a better life. Now they are generously sharing what they have learned through an easy-to-read workbook--one chapter a week." --Scott M. Bock, founder, president, and CEO of Riverside Community Care "Anxiety is the most common psychological problem affecting health and well-being (followed by depression). The Yoga-CBT Workbook for Anxiety combines the proven effectiveness of CBT for relieving anxiety and depression through what we say to ourselves with the proven effectiveness of yoga through its effect on the body. Readers will find this book understandable and comfortable, with exercises that are easy to follow, and helpful for replacing the patterns that create or maintain their anxiety and depression. This is an excellent, practical workbook that will be useful for individuals trying to improve their own management of anxiety and depression, as well as for therapists, yoga instructors, or others who work with people who struggle with anxiety." --Paul Block, PhD, principal at 3-Point Consulting "Blending yoga and CBT is genius. The transformation among my clients has been significant. As a clinician who runs yoga-CBT groups, this workbook is invaluable for clients to keep their practice going. The workbook is clear, concise, and informative. It's a must-have for clients and clinicians alike." --Jacqueline Vorpahl, PhD, owner and child and family psychologist at Vorpahl Psychology Associates, LLC, and creator of the Chilloutz app for kids "Julie Greiner-Ferris and Manjit Kaur Khalsa have created a breakthrough approach to treating anxiety with The Yoga-CBT Workbook for Anxiety. This workbook presents a seamless integration of researched, cutting-edge mind-body techniques and traditional therapeutic approaches. These techniques are for everyone, and illustrate that the mind-body connection is the most powerful way to address both the mental and physical aspects of anxiety." --Hari Kaur Khalsa, author of A Woman's Book of Meditation, coauthor of A Woman's Book of Yoga, andKundalini yoga teacher, trainer, and owner at Hari NYC "Greiner-Ferris and Khalsa build on years of evidence to present their readers with a six-week program to reduce anxiety. The Yoga-CBT Workbook for Anxiety is filled with great ideas for decreasing anxiety and living a more productive life! The step-by-step yoga, meditation, and cognitive behavioral therapy (CBT) strategies are practical, straightforward, and helpful. I highly recommend this book for anyone who experiences anxiety, is a mental health provider, or is a yoga practitioner or teacher." --Ellen Tuchman, PhD, associate professor and coordinator of the Evidence-Based Mental Health Project at the New York University Silver School of Social Work "Relax the body, clear the mind, and act against what you foolishly fear. That's how to free yourself from anxiety. This book describes how to do it. Greiner-Ferris and Khalsa blend a pleasant yoga relaxation program with Eastern wisdom and cognitive behavioral ways of knowing and doing that interested readers can easily follow to free themselves from needless anxieties and lead an enlightened life." Julie Greiner-Ferris, LCSW, has over twenty-five years of experience in the treatment of mental health issues. A graduate of Boston College GSSW, she is cocreator of yoga-cognitive behavioral therapy (Y-CBT), and is currently program director of outpatient services at Riverside Community Care in Upton, MA. Manjit Kaur Khalsa, EdD, is cocreator of yoga-cognitive behavioral therapy (Y-CBT), and is a highly experienced psychologist, practicing at Riverside Community Care in Upton, MA, and in private practice in Millis, MA. She is a longtime yoga teacher and student of Yogi Bhajan, and president of Sikh Dharma of Massachusetts, the corporation which oversees the Guru Ram Das and Yoga Center Ashram in Millis, MA.